Charlie Christian actually played an ES-250. 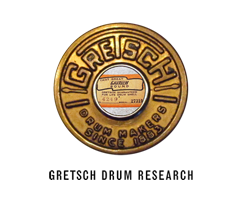 States that the in the batch #13700-13799 only two labels were used (for Chet’s two prototype 6120’s). It appears that there was a group of 100 New Yorker acoustic models from #13650-13750, or thereabouts. So this makes only 48 missing/unused labels, not 98. This section discusses the existence of only 2 labels from the #137xx batch (later updated as being #13750-13799). 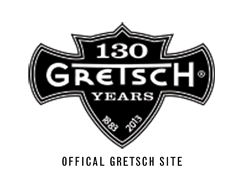 A recent discovery by the author confirms a third example at #13767, which shares the 21 fret and unbound headstock specifications with the other two. This guitar has a clear “6120” model stamp on it’s interior label. 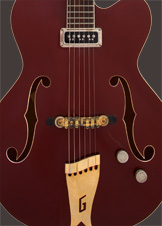 This guitar was discovered to be in the possession of Bobby Cochran, nephew of Eddie Cochran. The history behind this guitar remains unclear, but as it’s serial number precedes the #13770 which Chet Atkins received, always referred to as the first 6120, THIS newly discovered specimen now becomes the earliest documented 6120. 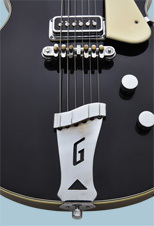 Photos of this guitar from the 60s reveal that the original signpost pickguard, perhaps the first ever, did not include the “Gretsch” logo, but did possess a white strip of binding material across the top edge. 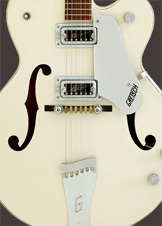 This guitar is plausibly the very first Gretsch to be granted a Bigsby vibrato (in this case an anodized B3) as well. There should be an asterisk (*) added to the 6120 batch #185xx (100 unit batch), in the list of 1956 model year batches, as there have been 6121 soldibodies associated with this group of 6120s. There should be an asterisk (*) added to the 6120 batch #232xx (100 unit batch), in the list of 1957 model year batches, as there have been 6121 soldibodies associated with this group of 6120s. 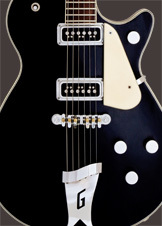 The existence of a batch of 1957 model year 6120 hollowbody models has been confirmed at #224xx. This group includes examples of the 6121 solidbody as well. There is an error in the first sentence. It should read… “Early 6120 examples with Filter’Trons have unmarked or plain pickup covers…”. 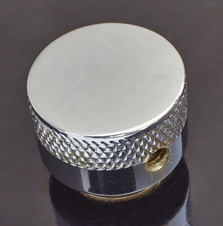 The inclusion of the word “chrome”, suggesting that these earliest 6120 covers were not gold plated was an error. There should be an asterisk (*) added to the 6120 batch #307xx (100 unit batch), in the list of 1959 model year batches, as there have been 6121 soldibodies associated with this group of 6120s. There should be an asterisk (*) added to the 6120 batch #345xx (100 unit batch), in the list of 1960 model year batches, as there have been 6121 soldibodies associated with this group of 6120s. Batch #341xx has been confirmed as being a 50 unit group. States that the change to the shallower 2.5” body depth on the 1960 6120 model occurred in batch #337xx. It now appears, through the revelation that some specimens from the previous batch (#330xx) exist featuring this shallower body specification, that there is even more support to the assertion that the #330xx batch of 6120s was the beginning of the 1960 model year for this model. There should be an asterisk (*) added to the 6120 batch #446xx (50 unit batch), in the list of 1961 model year batches, as there have been 6121 soldibodies associated with this (final) group of single-cutaway 6120s. 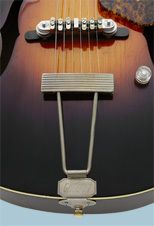 The Filter’Tron pickups adapted a 3-prong plug relieving the need to break solder joints upon removal for the 1960 model year (as depicted). 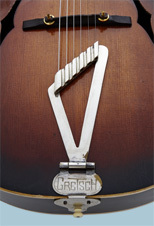 John Lennon owned Gretsch 6120 #53940 (’63 model year), and is purported to have written Paperback Writer on it. He was not known to travel or perform with it. 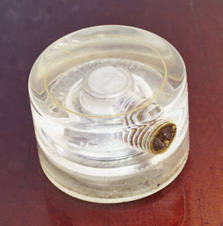 It was gifted by Lennon to his cousin David Birch in 1967. It’s suggested that the Nashville model 7660 was produced through December of 1978. A confirmed example from April 1979 has surfaced to establish the model’s survival into 1979. A previously undocumented reissue 6120 model from 1996 has been identified. 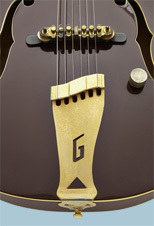 It is called the G6120-1955 Nashville Custom, and was apparently made in the US. Curiously this guitar has few features that might associate it with the classic 1955 6120. 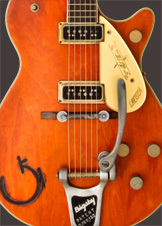 Correct features include an orange finish, its 2 gold Dynasonic pickups, and the correct wiring scheme (tone knob). 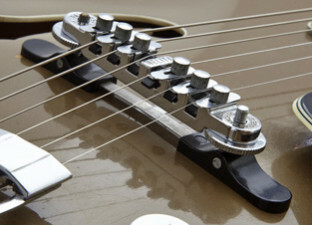 Most of the remaining features such as its enamel-faced swivel arm Bigsby, hump-block inlays, horseshoe motif headstock, large truss rod cover, G-arrow knobs, plain gold pickguard (Gretsch logo only) and lack of G-brand on the body, are all departures from the 1955 specification. 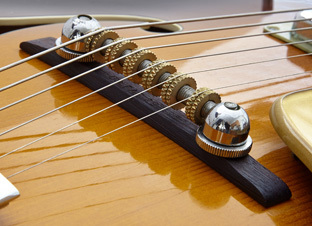 The guitar features a flame grain body with lacquer(?) 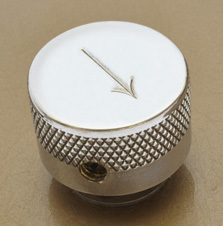 finish, and reportedly had an original MSRP of $8000 (supporting the claim of a US made instrument). 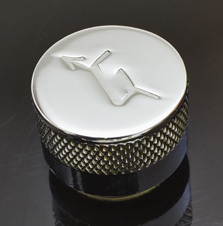 No information on how many of these were produced has been made available.